We're very excited to bring you news of yet another powerful new feature on plotaroute.com - Abbreviated Directions. You can now create your very own custom list of abbreviations to be used when producing directions for your routes. Shorthand versions of common phrases can be set up, making directions easier to read and also better for display on small screens like cycle computers and other GPS devices. Replace "Street" with St", "Turn sharp left" with "Sharp L", "Head northwest onto" with "NW on". You can easily see how lengthy directions can be quickly converted to make them easier to use on the move. Any abbreviations you set up will automatically apply as you plot new routes. You can also retrospectively apply them to any of your existing routes. 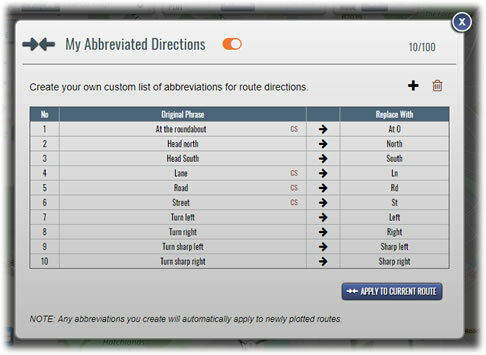 To access your abbrevations, click on the new "ABBREVIATIONS" button in the Directions panel of the route planner. The new Abbreviated Directions feature is available on both the desktop and mobile route planners for both Standard and Premium members, although different usage limits apply (please see our Membership Options page for further details on this). Its really easy shorten the labels and also to change Swedish char åäö to aao that my watch can handle.